A unique wildlife jungle safari adventure aboard hunting Elephants and Land Cruisers and canoes in the world famous Chitwan National Park of Nepal... An unforgettable experience! The park covers an area of 932 sq. Kms. of grassland, riverine areas and tall forest. This is a refuge for some of the rare wild life habitat including the great one horned Rhinoceros, the famous sloth bear and leopard, four species of deer and the elusive Bengal Tiger. Accommodations are at the Lodge and tented camps. A famous game park and tiger reserve in Rajasthan. From Delhi to Jaipur then by train to Sawai Madhupur, about 6 miles from the game park. Accommodations are at the Royal forest lodge, providing colonial style amenities and services in a cozy atmosphere. Game viewing aboard elephants and jeeps include Bengal Tiger, Leopard, Nilgai and Chetal to name a few. Operation Tiger Project was launched here to preserve the Tiger. Accommodations, All Meals, Wildlife Safari and Round trip airfare from Kathmandu. Day 1. Arrive in the heart of the Royal Chitwan National Park, home to a multitude of wildlife and birdlife, Tiger Tops offers a charming and stylish jungle experience. From the lodge, discover all that the jungle has to offer, moving about on elephant-back, dug-out canoe, by jeep or on foot, always in the safe hands of expert guides, some of whom have over 30 years of experience. All the double rooms, which are elevated in tree-houses for spectacular views, have en suite bathrooms with solar-heated, piping hot water. Enjoy the lodge’s Nepalese and Western cuisine; all produce is fresh and comes from Tiger Mountain’s organic farms. And the fully-stocked bar stays open until the last person goes to bed. At Tiger Tops Jungle Lodge individual interests are encouraged and programs are designed after discussion with every guest. Tiger Tops remains the leader in conservation and environmental control. Day 2. Full day jungle activities including elephant safaris, jungle walks, bird watching, village exploration by ox cart, sunset watches, jungle drive, boat ride, tharu cultural dance with all meals. Day 3. Tiger Tops-Kathmandu Departure After breakfast and early morning activities, transfer to airport. Fly Meghauly/Kathmandu. Arrive Kathmandu domestic airport and transfer. lodge 2 night's accommodations, All Meals, and Wildlife Safari and Round trip airfare from Kathmandu. A scenic drive to Chitwan National Park A world class wild life safari awaits you. Transfer to Jungle camp. Half day safari. Evening is spent around a bonfire and folk dance entertainment. Morning bird watching tour followed by full day safari aboard elephants and canoes. Evening folk dance and dinner entertainment. further stay or transfer to airport for Delhi flight. Jungle camps with all meals, transfer to and from Kathmandu, park fees, guide, and all safaris. Corbet National Park one of India's famous wild life reservoirs was discovered in 1936 and has ever since attracted adventure seekers from across the world for its variety of wild animals and exotic birds. Hero you can experience India's. Finest games by jeeps and trained elephants. Among some of the 500 species found in the Corbett Park are Tiger, Leopard, Jungle cat, Jackal, wild Boar just to name a few Corbett jungle tours are operated between November and May for best variety and comfortable game viewing. It is definitely and experience rare and rewarding. Surface transport to/from Delhi to Corbett Jungle Game park Accommodation at Jungle Lodge with all meals, Safari aboard Jeep and elephants with experience guides. Camel Safari (Rajasthan) 8 Days Like no other holiday ever! 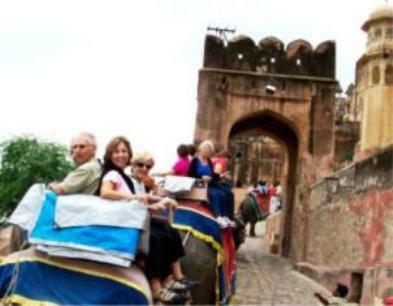 This unique tour includes exotic mode of camel journey across the great Thar Desert in Rajasthan. Here you'll experience first-hand, the desert life; where its people lend color to the landscape with their costumes and music, allowing the desert to come alive! You will be escorted by our desert guides who'll pamper you during this adventurous trip. Experience this unique adventure across the huge sand dunes and majestic castles. First class hotel with daily breakfast, airport transfers, baggage handling, and sightseeing tours with local guides, all entree fees, all meals on camel trekking expedition, all trekking gear and support staff of cooks, guides, helpers, tents, trek permits, local taxes and service charges.